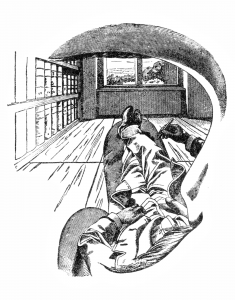 Excerpt from the “antimetaphysical” first chapter of: Ernst Mach, The analysis of sensations, and the relation of the physical to the psychical, translated from the first German edition by Cora May Williams, revised and supplemented from the fifth edition by Sydney Waterlow (London: Open Court Publishing Company, 1914). — Referring back to this posting. The original German edition was first published in 1886. The source of the 1914 English edition was Mach’s fifth edition published in 1906. It is also available in a German web edition. This little edition should have the advantage of the complete text of this particular chapter and links to most of the texts mentioned. The German WikiSource page on Ernst Mach lists all the digitizations of Mach’s publications in German. Several threads of thought and argumentation are running through this text. The most prominent of these threads lead back to René Descartes’ Meditations (1641). They have apparently passed through Immanuel Kant’s Prolegomena (1783) and have (one might say) not yet arrived in Ludwig Wittgenstein’s Tractatus (1922). What can we actually claim to know? Descartes had asked. “I must exist, if I can think of such a question”, he had said. Mach quotes Georg Christoph Lichtenberg against this certainty: We have sensations – visual sensations, tactile sensations, sensations of an effort of will before we move a limb… But we can hardly go beyond these sensations. They exist. All further talk about us and about the world we perceive is strictly speaking an interpretation of these sensations. It is easy to see why Mach is right. Awaking from a dream, we have all experienced what it means to interpreted a stream of sensations. It feels pretty real, even though the imagined environment was made up of the same sensational stuff as the hands we had just identified as “our hands” in that dream. In a Kantian refutation of naïve Empiricism Mach gives a picture of what we actually see – through one eye and with Mach’s beard under Mach’s nose in his particular case (Fig. 1). 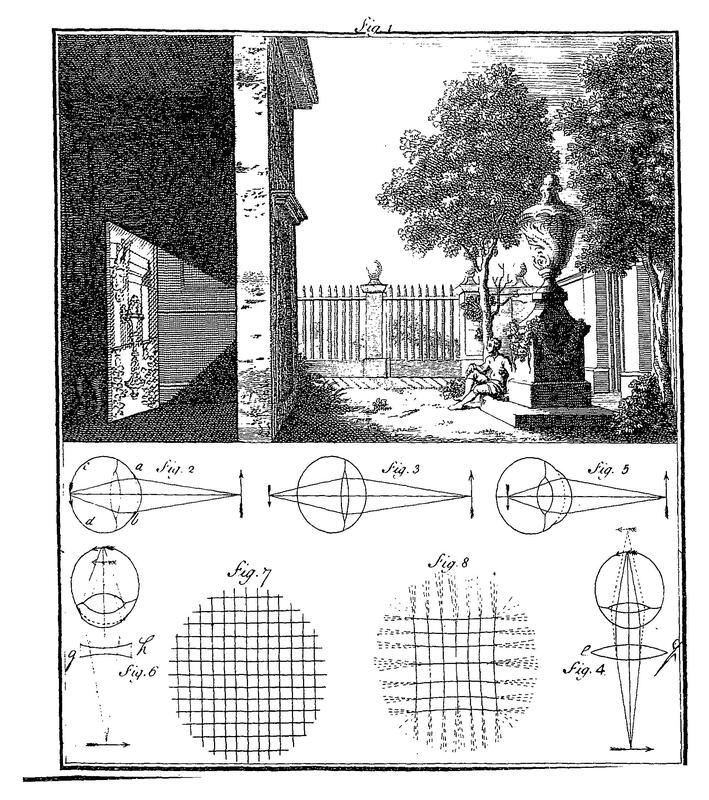 18th century books on visual representation gave the empiricist’s picture of what we can, so Mach, only construct (Fig. 2). Wittgenstein will reiterate this with more clarity: We do see our field of sight. Fig. 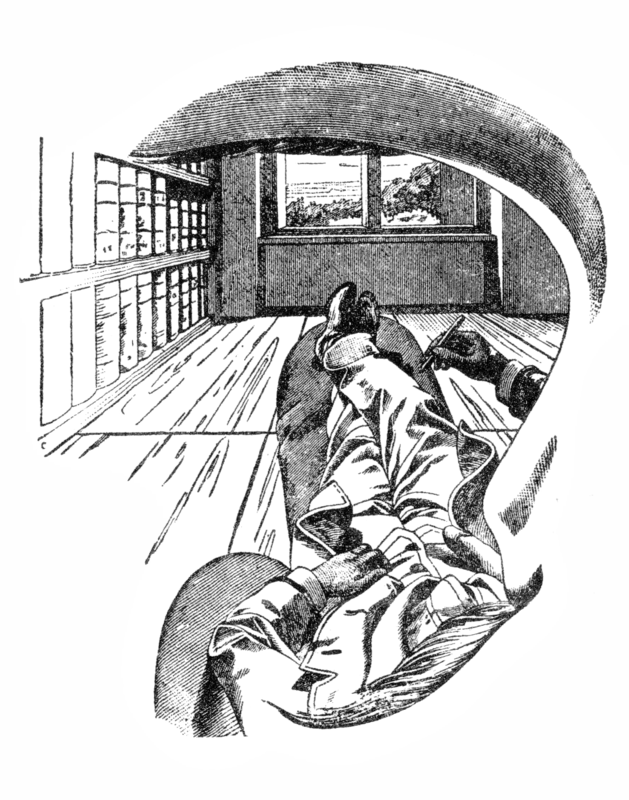 1: Ernst Mach, Analyse der Empfindungen (1886). Fig. 2: James, Ayscough, A short account of the eye, and nature of vision. Chiefly designed to illustrate the use and advantage of spectacles (London, 1752). Fig. 3: Ludwig Wittgenstein, Tractatus (1922). Kant was, so Mach, far too eager to make statements about things as they are by themselves – whether seen or not seen. No such thing does ever become part of the stream of sensations we are interpreting. The central problem of Mach’s philosophy is (Mach admits this in his final lines) its inherent solipsism – not a problem in Mach’s view but simply the situation every scientist and every private observer has to handle anyway. Avoiding all metaphysics Mach is, however, ready to go far beyond all his sensations. Death is interpreted as the moment when our sensations fall apart – more a metaphysical belief than an experience, Wittgenstein would say. Mach’s solipsism is eventually useless in the turn Wittgenstein will propose. Mach had already been unable to define any of his “elements” of sensations (he uses letters as placeholders). Is “my arm” such an element? Or does this element already consist of billions of elements – are we speaking of pixel sensations and nerve impulses? Not really. Wittgenstein will get back onto the ground of inter-subjective statements with his look at all the statements we make, whether as private observers or as scientists. They make sense as long as we know when we will affirm such a statement as a verified fact. Scientists deal with facts, so the turn towards statements several observers can verify. THE great results achieved by physical science in modern times – results not restricted to its own sphere but embracing that of other sciences which employ its help – have brought it about that physical ways of thinking and physical modes of procedure enjoy on all hands unwonted prominence, and that the greatest expectations are associated with their application. In keeping with this drift of modern inquiry, the physiology of the senses, gradually abandoning the method of investigating sensations in themselves followed by men like Goethe, Schopenhauer, and others, but with greatest success by Johannes Müller, has also assumed an almost exclusively physical character. This tendency must appear to us as not altogether appropriate, when we reflect that physics, despite its considerable development, nevertheless constitutes but a portion of a larger collective body of knowledge, and that it is unable, with its limited intellectual implements, created for limited and special purposes, to exhaust all the subject-matter in question. Without renouncing the support of physics, it is possible for the physiology of the senses, not only to pursue its own course of development, but also to afford to physical science itself powerful assistance. The following simple considerations will serve to illustrate this relation between the two. Colours, sounds, temperatures, pressures, spaces, times, and so forth, are connected with one another in manifold ways; and with them are associated dispositions of mind, feelings, and volitions. Out of this fabric, that which is relatively more fixed and permanent stands prominently forth, engraves itself on the memory, and expresses itself in language. Relatively greater permanency is exhibited, first, by certain complexes of colours, sounds, pressures, and so forth, functionally connected in time and space, which therefore receive special names, and are called bodies. Absolutely permanent such complexes are not. My friend may put on a different coat. His countenance may assume a serious or a cheerful expression. His complexion, under the effects of light or emotion, may change. His shape may be altered by motion, or be definitely changed. Yet the number of the permanent features presented, compared with the number of the gradual alterations, is always so great, that the latter may be overlooked. It is the same friend with whom I take my daily walk. My coat may receive a stain, a tear. My very manner of expressing this shows that we are concerned here with a sum-total of permanency, to which the new element is added and from which that which is lacking is subsequently taken away. Our greater intimacy with this sum-total of permanency, and the preponderance of its importance for me as contrasted with the changeable element, impel us to the partly instinctive, partly voluntary and conscious economy of mental presentation and designation, as expressed in ordinary thought and speech. That which is presented in a single image receives a single designation, a single name. Further, that complex of memories, moods, and feelings, joined to a particular body (the human body), which is called the “I” or “Ego,” manifests itself as relatively permanent. I may be engaged upon this or that subject, I may be quiet and cheerful, excited and ill-humoured. Yet, pathological cases apart, enough durable features remain to identify the ego. Of course, the ego also is only of relative permanency. The ego is as little absolutely permanent as are bodies. That which we so much dread in death, the annihilation of our permanency, actually occurs in life in abundant measure. That which is most valued by us, remains preserved in countless copies, or, in cases of exceptional excellence, is even preserved of itself. In the best human being, however, there are individual traits, the loss of which neither he himself nor others need regret. Indeed, at times, death, viewed as a liberation from individuality, may even become a pleasant thought. Such reflections of course do not make physiological death any the easier to bear. After a first survey has been obtained, by the formation of the substance-concepts “body” and “ego” (matter and soul), the will is impelled to a more exact examination of the changes that take place in these relatively permanent existences. The element of change in bodies and the ego, is in fact, exactly what moves the will  to this examination. Here the component parts of the complex are first exhibited as its properties. A fruit is sweet; but it can also be bitter. Also, other fruits may be sweet. The red colour we are seeking is found in many bodies. The neighbourhood of some bodies is pleasant; that of others, unpleasant. Thus, gradually, different complexes are found to be made up of common elements. The visible, the audible, the tangible, are separated from bodies. The visible is analysed into colours and into form. In the manifoldness of the colours, again, though here fewer in number, other component parts are discerned – such as the primary colours, and so forth. The complexes are disintegrated into elements,  that is to say, into their ultimate component parts, which hitherto we have been unable to subdivide any further. The nature of these elements need not be discussed at present; it is possible that future investigations may throw light on it. We need not here be disturbed by the fact that it is easier for the scientist to study relations of relations of these elements than the direct relations between them. Once, when a young man, I noticed in the street the proﬁle of a face that was very displeasing and repulsive to me. I was not a little taken aback when a moment afterwards I found that it was my own face which, in passing by a shop where mirrors were sold, I had perceived reflected from two mirrors that were inclined at the proper angle to each other. Not long ago, after a trying railway journey by night, when I was very tired, I got into an omnibus, just as another man appeared at the other end. “What a shabby pedagogue that is, that has just entered,” thought I. It was myself: opposite me hung a large mirror. The physiognomy of my class, accordingly, was better known to me than my own. Cp. Hume, Treatise on Human Nature, Vol. 1. part iv., p. 6; Gruithuisen, Beitäge zur Pysiognosie und Eautognosie, Munich, 1812, pp. 37-58. Not to be taken in the metaphysical sense. If this process be regarded as an abstraction, the elements, as we shall see, do not thereby lose anything of their importance. Cp. the subsequent discussion of concepts in Chapter XIV. The useful habit of designating such relatively permanent compounds by single names, and of apprehending them by single thoughts, without going to the trouble each time of an analysis of their component parts, is apt to come into strange conflict with the tendency to isolate the component parts. The vague image which we have of a given permanent complex, being an image which does not perceptibly change when one or another of the component parts is taken away, seems to be something which exists in itself. Inasmuch as it is possible to take away singly every constituent part without destroying the capacity of the image to stand for the totality and to be recognised again, it is imagined that it is possible to subtract all the parts and to have something still remaining. Thus naturally arises the philosophical notion, at first impressive, but subsequently recognised as monstrous, of a “thing-in-itself,” different from its “appearance,” and unknowable. Thing, body, matter, are nothing apart from the combinations of the elements, – the colours, sounds, and so forth – nothing apart from their so-called attributes. That protean pseudo-philosophical problem of the single thing with its many attributes, arises wholly from a misinterpretation of the fact, that summary comprehension and precise analysis, although both are provisionally justifiable and for many purposes profitable, cannot be carried on simultaneously. A body is one and unchangeable only so long as it is unnecessary to consider its details. Thus both the earth and a billiard-ball are spheres, if we are willing to neglect all deviations from the spherical form, and if greater precision is not necessary. But when we are obliged to carry on investigations in orography or microscopy, both bodies cease to be spheres. Cp. W. Schuppe’s polemic against Ueberweg, printed in Brasch’s Welt- und Lebensanschauung Ueberwegs, Leipzig, 1889; F. J. Schmidt, Das: Ärgernis: der Philosophie: eine Kantstudie, Berlin, 1897. Man is pre-eminently endowed with the power of voluntarily and consciously determining his own point of view. He can at one time disregard the most salient features of an object, and immediately thereafter give attention to its smallest details; now consider a stationary current, without a thought of its contents (whether heat, electricity or fluidity), and then measure the width of a Fraunhofer line in the spectrum; he can rise at will to the most general abstractions or bury himself in the minutest particulars. Animals possess this capacity in a far less degree. They do not assume a point of view, but are usually forced to it by their sense-impressions. The baby that does not know its father with his hat on, the dog that is perplexed at the new coat of its master, have both succumbed in this conflict of points of view. Who has not been worsted in similar plights? Even the man of philosophy at times succumbs, as the grotesque problem, above referred to, shows. In this last case, the circumstances appear to furnish a real ground of justification. Colours, sounds, and the odours of bodies are evanescent. But their tangibility, as a sort of constant nucleus, not readily susceptible of annihilation, remains behind; appearing as the vehicle of the more fugitive properties attached to it. Habit, thus, keeps our thought firmly attached to this central nucleus, even when we have begun to recognise that seeing hearing, smelling, and touching are intimately akin in character. A further consideration is, that owing to the singularly extensive development of mechanical physics a kind of higher reality is ascribed to the spatial and to the temporal than to colours, sounds, and odours; agreeably to which, the temporal and spatial links of colours, sounds, and odours appear to be more real than the colours, sounds and odours themselves. The physiology of the senses, however, demonstrates, that spaces and times may just as appropriately be called sensations as colours and sounds. But of this later. Let us denote the above-mentioned elements by the letters ABC…, KLM…, αβγ… Let those complexes of colours, sounds, and so forth, commonly called bodies, be denoted, for the sake of clearness, by ABC…; the complex, known as our own body, which is a part of the former complexes distinguished by certain peculiarities, may be called KLM…; the complex composed of volitions, memory-images, and the rest, we shall represent by αβγ… Usually, now, the complex αβγ… KLM…, as making up the ego, is opposed to the complex ABC…, as making up the world of physical objects; sometimes also, αβγ… is viewed as ego, and KLM… ABC… as world of physical objects. Now, at first blush, ABC… appears independent of the ego, and opposed to it as a separate existence. But this independence is only relative, and gives way upon closer inspection. Much, it is true, may change in the complex αβγ… without much perceptible change being induced in ABC…; and vice versa. But many changes in αβγ… do pass, by way of changes in KLM…, to ABC…; and vice versa. (As, for example, when powerful ideas burst forth into acts, or when our environment induces noticeable changes in our body.) At the same time the group KLM… appears to be more intimately connected with αβγ… and with ABC…, than the latter with one another; and their relations find their expression in common thought and speech. Precisely viewed, however, it appears that the group ABC… is always codetermined by KLM. A cube when seen close at hand, looks large; when seen at a distance, small; its appearance to the right eye differs from its appearance to the left; sometimes it appears double; with closed eyes it is invisible. The properties of one and the same body, therefore, appear modified by our own body; they appear conditioned by it. But where, now, is that same body, which appears so different? All that can be said is, that with different KLM different ABC… are associated. A common and popular way of thinking and speaking is to contrast “appearance” with “reality” A pencil held in front of us in the air is seen by us as straight; dip it into the water, and we see it crooked. In the latter case we say that the pencil appears crooked, but is in reality straight. But what justifies us in declaring one fact rather than another to be the reality, and degrading the other to the level of appearance? In both cases we have to do with facts which present us with different combinations of the elements, combinations which in the two cases are differently conditioned. Precisely because of its environment the pencil dipped in water is optically crooked; but it is tactually and metrically straight. An image in a concave or flat mirror is only visible, whereas under other and ordinary circumstances a tangible body as well corresponds to the visible image. A bright surface is brighter beside a dark surface than beside one brighter than itself. To be sure, our expectation is deceived when, not paying sufficient attention to the conditions, and substituting for one another different cases of the combination, we fall into the natural error of expecting what we are accustomed to, although the case may be an unusual one. The facts are not to blame for that. In these cases, to speak of “appearance” may have a practical meaning, but cannot have a scientific meaning. Similarly, the question which is often asked, whether the world is real or whether we merely dream it, is devoid of all scientific meaning. Even the wildest dream is a fact as much as any other. If our dreams were more regular, more connected, more stable, they would also have more practical importance for us. In our waking hours the relations of the elements to one another are immensely amplified in comparison with what they were in our dreams. We recognise the dream for what it is. When the process is reversed, the field of psychic vision is narrowed; the contrast is almost entirely lacking. Where there is no contrast, the distinction between dream and waking, between appearance and reality, is quite otiose and worthless. The popular notion of an antithesis between appearance and reality has exercised a very powerful influence on scientific and philosophical thought. We see this, for example, in Plato‘s pregnant and poetical fiction of the Cave, in which, with our backs turned towards the fire, we observe merely the shadows of what passes (Republic, vii. 1). But this conception was not thought out to its final consequences, with the result that it has had an unfortunate influence on our ideas about the universe. The universe, of which nevertheless we are a part, became completely separated from us, and was removed an infinite distance away. Similarly, many a young man, hearing for the first time of the refraction of stellar light, has thought that doubt was cast on the whole of astronomy, whereas nothing is required but an easily effected and unimportant correction to put everything right again. A long time ago (in the Vierteljahreszeitschrift für Psychiatrie, Leipzig and Neuwied, 1868, art. “Ueber die Abhängigkeit der Netzhautstellen von einander”) I enunciated this thought as follows: The expression “sense-illusion” proves that we are not yet fully conscious, or at least have not yet deemed it necessary to incorporate the fact into our ordinary language, that the sense: represent things neither wrongly nor correctly. All that can be truly said of the sense-organs is, that, under different circumstances they produce different sensations and perceptions. As these “circumstances,” now, are extremely various in character, being partly external (inherent in the objects), partly internal (inherent in the sensory organs), and partly interior (having their activity in the central organs), it can sometimes appear, when we only notice the external circumstances, as if the organ acted differently under the same conditions. And it is customary to call the unusual effects, deceptions or illusions. We see an object having a point S. If we touch S, that is, bring it into connexion with our body, we receive a prick. We can see S, without feeling the prick. But as soon as we feel the prick we find S on the skin. The visible point, therefore, is a permanent nucleus, to which the prick is annexed, according to circumstances, as something accidental. From the frequency of analogous occurrences we ultimately accustom ourselves to regard all properties of bodies as “effects” proceeding from permanent nuclei and conveyed to the ego through the medium of the body; which effects we call sensations. By this operation, however, these nuclei are deprived of their entire sensory content, and converted into mere mental symbols. The assertion, then, is correct that the world consists only of our sensations. In which case we have knowledge only of sensations, and the assumption of the nuclei referred to, or of a reciprocal action between them, from which sensations proceed, turns out to be quite idle and superfluous. Such a view can only suit with a half-hearted realism or a half-hearted philosophical criticism. Ordinarily the complex αβγ… KLM… is contrasted as ego with the complex ABC… At first only those elements of ABC… that more strongly alter αβγ… as a prick, a pain, are wont to be thought of as comprised in the ego. Afterwards, however, through observations of the kind just referred to, it appears that the right to annex ABC… to the ego nowhere ceases. In conformity with this view the ego can be so extended as ultimately to embrace the entire world. The ego is not sharply marked off, its limits are very indefinite and arbitrarily displaceable Only by failing to observe this fact, and by unconsciously narrowing those limits, while at the same time we enlarge them, arise, in the conflict of points of view, the metaphysical difficulties met with in this connexion. As soon as we have perceived that the supposed unities “body” and “ego” are only makeshifts, designed for provisional orientation and for definite practical ends (so that we may take hold of bodies, protect ourselves against pain, and so forth), we find ourselves obliged, in many more advanced scientific investigations, to abandon them as insufficient and inappropriate. The antithesis between ego and world, between sensation (appearance) and thing, then vanishes, and we have simply to deal with the connexion of the elements αβγ… ABC… KLM…, of which this antithesis was only a partially appropriate and imperfect expression. This connexion is nothing more or less than the combination of the above-mentioned elements with other similar elements (time and space). Science has simply to accept this connexion, and to get its bearings in it, without at once wanting to explain its existence. On a superficial examination the complex αβγ… appears to be made up of much more evanescent elements than ABC… and KLM…, in which last the elements seem to be connected with greater stability and in a more permanent manner (being joined to solid nuclei as it were). Although on closer inspection the elements of all complexes prove to be homogeneous, yet even when this has been recognised, the earlier notion of an antithesis of body and spirit easily slips in again. The philosophical spiritualist is often sensible of the difficulty of imparting the needed solidity to his mind-created world of bodies; the materialist is at a loss when required to endow the world of matter with sensation. The monistic point of view, which reflexion has evolved, is easily clouded by our older and more powerful instinctive notions. When I say that the table, the tree, and so forth, are my sensations, the statement, as contrasted with the mode of representation of the ordinary man, involves a real extension of my ego. On the emotional side also such extensions occur, as in the case of the virtuoso, who possesses as perfect a mastery of his instrument as he does of his own body; or in the case of the skillful orator, on whom the eyes of the audience are all converged, and who is controlling the thoughts of all; or in that of the able politician who is deftly guiding his party; and so on. In conditions of depression, on the other hand, such as nervous people often endure, the ego contracts and shrinks. A wall seems to separate it from the world. The difficulty referred to is particularly felt when we consider the following case. In the complex ABC…. which we have called the world of matter, we find as parts, not only our own body KLM…, but also the bodies of other persons (or animals) K’L’M’…, K”L”M”… to which, by analogy, we imagine other α’β’γ’…, α”β”γ”…, annexed, similar to αβγ… So long as we deal with K’L’M’…, we find ourselves in a thoroughly familiar province which is at every point accessible to our senses. When, however, we inquire after the sensations or feelings belonging to the body K’L’M’…, we no longer find these in the province of sense: we add them in thought. Not only is the domain which we now enter far less familiar to us, but the transition into it is also relatively unsafe. We have the feeling as if we were plunging into an abyss. Persons who adopt this way of thinking only, will never thoroughly rid themselves of that sense of insecurity, which is a very fertile source of illusory problems. But we are not restricted to this course. Let us consider, first, the reciprocal relations of the elements of the complex ABC…, without regarding KLM… (our body). All physical investigations are of this sort. A white ball falls upon a bell; a sound is heard. The ball turns yellow before a sodium lamp, red before a lithium lamp. Here the elements (ABC…) appear to be connected only with one another and to be independent of our body (KLM…). But if we take santonin, the ball again turns yellow. If we press one eye to the side, we see two balls. If we close our eyes entirely, there is no ball there at all. If we sever the auditory nerve, no sound is heard. The elements ABC…, therefore, are not only connected with one another, but also with KLM. To this extent, and to this extent only, do we call ABC… sensations, and regard ABC as belonging to the ego. In what follows, wherever the reader finds the terms “Sensation,” “Sensation-complex,” used alongside of or instead of the expressions “element,” “complex of elements,” it must be borne in mind that it is only in the connexion and relation in question, only in their functional dependence, that the elements are sensations. In another functional relation they are at the same time physical objects. We only use the additional term “sensations” to describe the elements, because most people are much more familiar with the elements in question as sensations (colours, sounds, pressures, spaces, times, etc. ), while according to the popular conception it is particles of mass that are considered as physical elements, to which the elements, in the sense here used, are attached as “properties” or “effects”. In this way, accordingly, we do not find the gap between bodies and sensations above described, between what is without and what is within, between the material world and the spiritual world. All elements ABC…, KLM…, constitute a single coherent mass only, in which, when any one element is disturbed, all is put in motion; except that a disturbance in KLM… has a more extensive and profound action than one in ABC… A magnet in our neighbourhood disturbs the particles of iron near it; a falling boulder shakes the earth; but the severing of a nerve sets in motion the whole system of elements. Quite involuntarily does this relation of things suggest the picture of a viscous mass, at certain places (as in the ego) more firmly coherent than in others. I have often made use of this image in lectures. When I first came to Vienna from the country, as a boy of four or ﬁve years, and was taken by my father upon the walls of the city’s fortiﬁcations, I was very much surprised to see people below in the moat, and could not understand how, from my point of view, they could have got there; for the thought of another way of descent never occurred to me. I remarked the same astonishment, once afterwards, in the case of a three-year-old boy of my own, while walking on the walls of Prague. I recall this feeling every time I occupy myself with the reflexion of the text, and I frankly confess that this accidental experience of mine helped to confirm my opinion upon this point, which I have now long held. Our habit of always following the same path, whether materially or psychically, tends greatly to confuse our ﬁeld of survey. A child, on the piercing of the wall of a house in which he has long dwelt, may experience a veritable enlargement of his worldview, and in the same manner a slight scientiﬁc hint may often afford great enlightenment. Both in reasoning from the observation of the bodies of other men or animals, to the sensations which they possess, as well as in investigating the influence of our own body upon our own sensations, we have to complete observed facts by analogy. This is accomplished with much greater ease and certainty, when it relates, say, only to nervous processes, which cannot be fully observed in our own bodies – that is, when it is carried out in the more familiar physical domain – than when it is extended to the psychical domain, to the sensations and thoughts of other people. Otherwise there is no essential difference. The considerations just advanced, expressed as they have been in an abstract form, will gain in strength and vividness if we consider the concrete facts from which they flow. Thus, I lie upon my sofa. If I close my right eye, the picture represented in the accompanying cut is presented to my left eye In a frame formed by the ridge of my eyebrow, by my nose, and by my moustache, appears a part of my body, so far as visible, with its environment. My body differs from other human bodies – beyond the fact that every intense motor idea is immediately expressed by a movement of it, and that, if it is touched, more striking changes are determined than if other bodies are touched – by the circumstance, that it is only seen piecemeal, and, especially, is seen without a head. If I observe an element A within my field of vision, and investigate its connexion with another element B within the same field, I step out of the domain of physics into that of physiology or psychology, provided B, to use the apposite expression of a friend  of mine made upon seeing this drawing, passes through my skin. 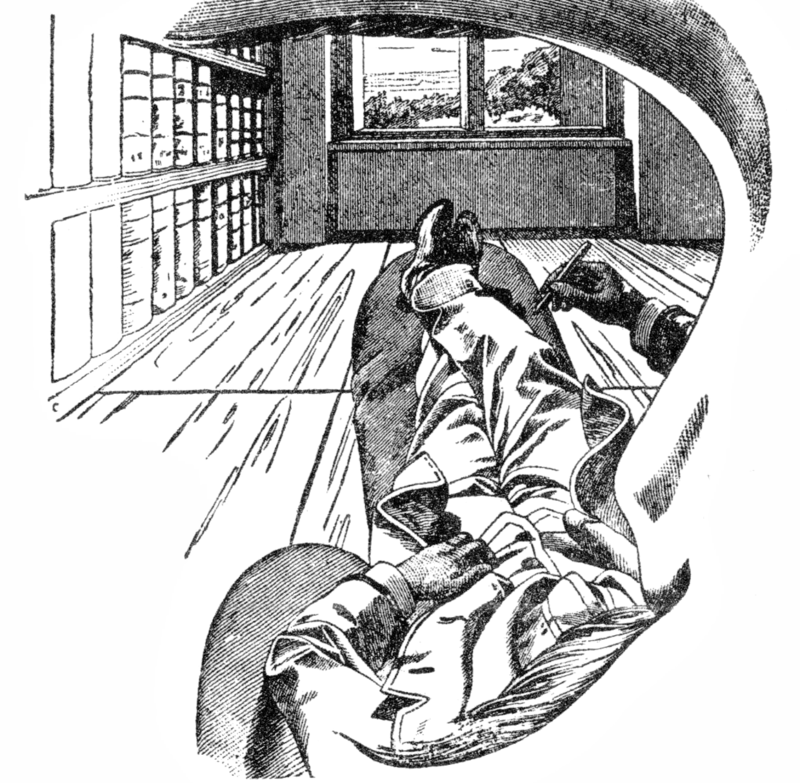 Reflexions like that for the field of vision may be made with regard to the province of touch and the perceptual domains of the other senses. 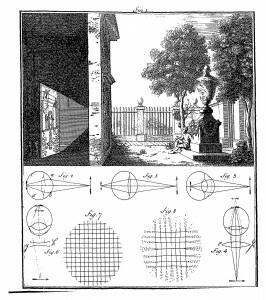 A discussion of the binocular field of vision, with its peculiar stereoscopic features, is omitted here, for although familiar to all, it is not as easy to describe, and cannot be represented by a single plane drawing. “Problem: To carry out the self-inspection of the Ego. In order to illustrate in a humorous manner this philosophical “much ado about nothing,” and at the same time to shew how the self-inspection of the Ego could be really “carried out,” I embarked on the above drawing. Mr L.’s society was most instructive and stimulating to me, owing to the naivety with which he gave utterance to philosophical notions that are apt to be carefully passed over in silence or involved in obscurity. Reference has already been made to the different character of the groups of elements denoted by ABC… and αβγ… As a matter of fact, when we see a green tree before us, or remember a green tree, that is, represent a green tree to ourselves, we are perfectly aware of the difference of the two cases. The represented tree has a much less determinate, a much more changeable form; its green is much paler and more evanescent; and, what is of especial note, it plainly appears in a different domain. A movement that we will to execute is never more than a represented movement, and appears in a different domain from that of the executed movement, which always takes place when the image is vivid enough. Now the statement that the elements A and α appear in different domains, means, if we go to the bottom of it, simply this, that these elements are united with different other elements. Thus far, therefore, the fundamental constituents of ABC…, αβγ… would seem to be the same (colours, sounds, spaces, times, motor sensations…), and only the character of their connexion different. Ordinarily pleasure and pain are regarded as different from sensations. Yet not only tactual sensations, but all other kinds of sensations, may pass gradually into pleasure and pain. Pleasure and pain also may be justly termed sensations. Only they are not so well analysed and so familiar, nor, perhaps, limited to so few organs as the common sensations. In fact, sensations of pleasure and pain, however faint they may be, really constitute an essential part of the content of all so-called emotions. Any additional element that emerges into consciousness when we are under the influence of emotions may be described as more or less diffused and not sharply localised sensations. William James, and after him Theodule Ribot, have investigated the physiological mechanism of the emotions: they hold that what is essential is purposive tendencies of the body to action – tendencies which correspond to circumstances and are expressed in the organism. Only a part of these emerges into consciousness. We are sad because we shed tears, and not vice versa, says James. And Ribot justly observes that a cause of the backward state of our knowledge of the emotions is that we have always confined our observation to so much of these physiological processes as emerges into consciousness. At the same time he goes too far when he maintains that everything psychical is merely “surajoute” to the physical, and that it is only the physical that produces effects. For us this distinction is non-existent. Thus, perceptions, presentations, volitions, and emotions, in short the whole inner and outer world, are put together, in combinations of varying evanescence and permanence, out of a small number of homogeneous elements. Usually, these elements are called sensations. But as vestiges of a one-sided theory inhere in that term, we prefer to speak simply of elements, as we have already done. The aim of all research is to ascertain the mode of connexion of these elements. If it proves impossible to solve the problem by assuming one set of such elements, then more than one will have to be assumed. But for the questions under discussion it would be improper to begin by making complicated assumptions in advance. That in this complex of elements, which fundamentally is only one, the boundaries of bodies and of the ego do not admit of being established in a manner definite and sufficient for all cases, has already been remarked. To bring together elements that are most intimately connected with pleasure and pain into one ideal mental-economical unity, the ego; this is a task of the highest importance for the intellect working in the service of the pain-avoiding, pleasure-seeking will. The delimitation of the ego, therefore, is instinctively effected, is rendered familiar, and possibly becomes fixed through heredity. Owing to their high practical importance, not only for the individual, but for the entire species, the composites “ego” and “body” instinctively make good their claims, and assert themselves with elementary force. In special cases, however, in which practical ends are not concerned, but where knowledge is an end in itself, the delimitation in question may prove to be insufficient, obstructive, and untenable. The primary fact is not the ego, but the elements (sensations). What was said on p. 21 [i.e. § 11 above] as to the term “sensation” must be borne in mind. The elements constitute the I. I have the sensation green, signifies that the element green occurs in a given complex of other elements (sensations, memories). When I cease to have the sensation green, when I die, then the elements no longer occur in the ordinary, familiar association. That is all. Only an ideal mental-economical unity, not a real unity, has ceased to exist. The ego is not a definite, unalterable, sharply bounded unity. None of these attributes are important; for all vary even within the sphere of individual life; in fact their alteration is even sought after by the individual. Continuity alone is important. This view accords admirably with the position which Weismann has reached by biological investigations. (“Zur Frage der Unsterblichkeit der Einzelligen,” Biolog. Centralbl., Vol. IV., Nos. 21, 22; compare especially pages 654 and 655, where the scission of the individual into two equal halves is spoken of.) But continuity is only a means of preparing and conserving what is contained in the ego. This content, and not the ego, is the principal thing. This content, however, is not confined to the individual. With the exception of some insignificant and valueless personal memories, it remains presented in others even after the death of the individual. The elements that make up the consciousness of a given individual are firmly connected with one another, but with those of another individual they are only feebly connected, and the connexion is only casually apparent. Contents of consciousness, however, that are of universal significance, break through these limits of the individual, and, attached of course to individuals again, can enjoy a continued existence of an impersonal, superpersonal kind, independently of the personality by means of which they were developed. To contribute to this is the greatest happiness of the artist, the scientist, the inventor, the social reformer, etc. The ego must be given up. It is partly the perception of this fact, partly the fear of it, that has given rise to the many extravagances of pessimism and optimism, and to numerous religious, ascetic, and philosophical absurdities. In the long run we shall not be able to close our eyes to this simple truth, which is the immediate outcome of psychological analysis. We shall then no longer place so high a value upon the ego, which even during the individual life greatly changes, and which, in sleep or during absorption in some idea, just in our very happiest moments, may be partially or wholly absent. We shall then be willing to renounce individual immortality, and not place more value upon the subsidiary elements than upon the principal ones. In this way we shall arrive at a freer and more enlightened view of life, which will preclude the disregard of other egos and the overestimation of our own. The ethical ideal founded on this view of life will be equally far removed from the ideal of the ascetic, which is not biologically tenable for whoever practises it, and vanishes at once with his disappearance, and from the ideal of an overweening Nietzschean “superman,” who cannot, and I hope will not be tolerated by his fellow-men. If a knowledge of the connexion of the elements (sensations) does not suffice us, and we ask, Who possesses this connexion of sensations, Who experiences it? then we have succumbed to the old habit of subsuming every element (every sensation) under some unanalysed complex, and we are falling back imperceptibly upon an older, lower, and more limited point of view. It is often pointed out, that a psychical experience which is not the experience of a determinate subject is unthinkable, and it is held that in this way the essential part played by the unity of consciousness has been demonstrated. But the Ego-consciousness can be of many different degrees and composed of a multiplicity of chance memories. One might just as well say that a physical process which does not take place in some environment or other, or at least somewhere in the universe, is unthinkable. In both cases, in order to make a beginning with our investigation, we must be allowed to abstract from the environment, which, as regards its influence, may be very different in different cases, and in special cases may shrink to a minimum. Consider the sensations of the lower animals, to which a subject with definite features can hardly be ascribed. It is out of sensations that the subject is built up, and, once built up, no doubt the subject reacts in turn on the sensations. The unity of consciousness is not an argument in point. Since the apparent antithesis between the real world and the world given through the senses lies entirely in our mode of view, and no actual gulf exists between them, a complicated and variously interconnected content of consciousness is no more difficult to understand than is the complicated interconnection of the world. If we regard the ego as a real unity, we become involved in the following dilemma: either we must set over against the ego a world of unknowable entities (which would be quite idle and purposeless), or we must regard the whole world, the egos of other people included, as comprised in our own ego (a proposition to which it is difficult to yield serious assent). But if we take the ego simply as a practical unity, put together for purposes of provisional survey, or as a more strongly cohering group of elements, less strongly connected with other groups of this kind, questions like those above discussed will not arise, and research will have an unobstructed future. In his philosophical notes Lichtenberg says: “We become conscious of certain presentations that are not dependent upon us; of others that we at least think are dependent upon us. Where is the border-line? We know only the existence of our sensations, presentations, and thoughts. We should say, It thinks, just as we say, It lightens. It is going too far to say cogito, if we translate cogito by I think. The assumption, or postulation, of the ego is a mere practical necessity.” Though the method by which Lichtenberg arrived at this result is somewhat different from ours, we must nevertheless give our full assent to his conclusion. Similarly, class-consciousness, class-prejudice, the feeling of nationality, and even the narrowest-minded local patriotism may have a high importance, for certain purposes. But such attitudes will not be shared by the broad-minded investigator, at least not in moments of research. All such egoistic views are adequate only for practical purposes. Of course, even the investigator may succumb to habit. Trifling pedantries and nonsensical discussions; the cunning appropriation of others’ thoughts, with perfidious silence as to the sources; when the word of recognition must be given, the difficulty of swallowing one’s defeat, and the too common eagerness at the same time to set the opponent’s achievement in a false light: all this abundantly shows that the scientist and scholar have also the battle of existence to fight, that the ways even of science still lead to the mouth, and that the pure impulse towards knowledge is still an ideal in our present social conditions. In wishing to preserve our personal memories beyond death, we are behaving like the astute Eskimo, who refused with thanks the gift of immortality without his seals and walruses. However far the distance is from theoretical understanding to practical conduct, still the latter cannot in the long run resist the former. As early as the writings of Johannes Müller, we can already ﬁnd a tendency towards views of this kind, although his metaphysical bias prevents him from carrying them to their logical conclusion. But Hering (Hermann’s Handbuch der Physiologie, Vol. III., p. 345) has the following characteristic passage: “The material of which visual objects consists is the visual sensations. The setting sun, as a visual object, is a flat, circular disk, which consists of yellowish-red color, that is to say of a visual sensation. We may therefore describe it directly as a circular, yellowish-red sensation. This sensation we have in the very place where the sun appears to us.” I must confess that, so far as the experiments go which I have had occasion to make in conversation, most people, who have not come to close quarters with these questions by serious thinking, will pronounce this way of looking at the matter to be mere hair-splitting. Of course, what is chieﬂy responsible for their indignation is the common confusion between sensible and conceptual space. But anyone who takes his stand as I do on the economic function of science, according to which nothing is important except what can be observed or is a datum for us, and everything hypothetical, metaphysical and superﬂuous, is to be eliminated, must reach the same conclusion. I think that a similar standpoint is to be ascribed to Avenarius, for in his Der menschliche Weltbegriff p. 76, the following passages occur: “The brain is not the dwelling-place, seat or producer of thought; it is not the instrument or organ, it is not the vehicle or substratum, etc., of thought.” “Thought is not an indweller or command-giver, it is not a second half or aspect, etc., nor is it a product; it is not even a physiological function of the brain, nor is it a state of the brain at all.” I am not able or willing to subscribe to all that Avenarius says or to any interpretation of what he says, but still his conception seems to me to approximate very nearly to my own. The method which he terms, “The exclusion of introjection,” is only a particular form of the elimination of the metaphysical. Bodies do not produce sensations, but complexes of elements (complexes of sensations) make up bodies. If, to the physicist, bodies appear the real, abiding existences, whilst the “elements” are regarded merely as their evanescent, transitory appearance, the physicist forgets, in the assumption of such a view, that all bodies are but thought-symbols for complexes of elements (complexes of sensations). Here, too, the elements in question form the real, immediate, and ultimate foundation, which it is the task of physiologico-physical research to investigate. By the recognition of this fact, many points of physiology and physics assume more distinct and more economical forms, and many spurious problems are disposed of. For us, therefore, the world does not consist of mysterious entities, which by their interaction with another, equally mysterious entity, the ego, produce sensations, which alone are accessible. For us, colours, sounds, spaces, times, … are provisionally the ultimate elements, whose given connexion it is our business to investigate. It is precisely in this that the exploration of reality consists. In this investigation we must not allow ourselves to be impeded by such abridgments and delimitations as body, ego, matter, spirit, etc., which have been formed for special, practical purposes and with wholly provisional and limited ends in view. On the contrary, the fittest forms of thought must be created in and by that research itself, just as is done in every special science. In place of the traditional, instinctive ways of thought, a freer, fresher view, conforming to developed experience, and reaching out beyond the requirements of practical life, must be substituted throughout. I have always felt it as a stroke of special good fortune, that early in life, at about the age of fifteen, I lighted, in the library of my father, on a copy of Kant’s Prolegomena to any Future Metaphysics. The book made at the time a powerful and ineffaceable impression upon me, the like of which I never afterwards experienced in any of my philosophical reading. Some two or three years later the superfluity of the role played by “the thing in itself” abruptly dawned upon me. On a bright summer day in the open air, the world with my ego suddenly appeared to me as one coherent mass of sensations, only more strongly coherent in the ego. Although the actual working out of this thought did not occur until a later period, yet this moment was decisive for my whole view. I had still to struggle long and hard before I was able to retain the new conception in my special subject. With the valuable parts of physical theories we necessarily absorb a good dose of false metaphysics, which it is very difficult to sift out from what deserves to be preserved, especially when those theories have become very familiar to us. At times, too, the traditional, instinctive views would arise with great power and place impediments in my way. 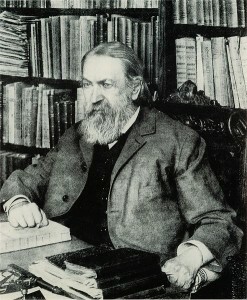 Only by alternate studies in physics and in the physiology of the senses, and by historico-physical investigations (since about 1863), and after having endeavoured in vain to settle the conflict by a physico-psychological monadology (in my lectures on psycho-physics, in the Zeitschrift für praktische Heilkunde, Vienna, 1863, p. 364), have I attained to any considerable stability in my views. I make no pretensions to the title of philosopher. I only seek to adopt in physics a point of view that need not be changed the moment our glance is carried over into the domain of another science; for, ultimately, all must form one whole. The molecular physics of today certainly does not meet this requirement. What I say I have probably not been the first to say. I also do not wish to offer this exposition of mine as a special achievement. It is rather my belief that every one will be led to a similar view, who makes a careful survey of any extensive body of knowledge. Avenarius, with whose works I became acquainted in 1883, approaches my point of view (Philosophie als Denken der Welt nach dem Princip des kleinsten Kraftmasses, 1876). Also Hering, in his paper on Memory (Almanach der Wiener Akademie, 1870, p. 258; English translation, O. C. Pub. Co., Chicago, 4th edition, enlarged, 1913), and J. Popper in his beautiful book, Das Recht zu leben und die Pflicht zu sterben (Leipzig, 1878, p. 62), have advanced allied thoughts. Compare also my paper Ueber die ökonomische Natur der physikalischen Forschung (Almanach der Wiener Akadernie, 1882, p. 179, note; English translation in my Popular Scientific Lectures, Chicago, 1894). Finally let me also refer here to the introduction to W. Preyer’s Reine Empfindungslehre to Riehl’s Freiburger Antrittsrede, p. 40, and to R. Wahle’s Gehirn und Bewusstsein, 1884. My views were indicated briefly in 1872 and 1875, and not expounded at length until 1882 and 1883. I should probably have much additional matter to cite as more or less allied to this line of thought, if my knowledge of the literature were more extensive. Science always has its origin in the adaptation of thought to some definite field of experience. The results of the adaptation are thought-elements, which are able to represent the whole field. The outcome, of course, is different, according to the character and extent of the field. If the field of experience is enlarged, or if several fields heretofore disconnected are united, the traditional, familiar thought-elements no longer suffice for the extended field. In the struggle of acquired habit with the effort after adaptation, problems arise, which disappear when the adaptation is perfected, to make room for others which have arisen meanwhile. To the physicist, quâ physicist, the idea of “body” is productive of a real facilitation of view, and is not the cause of disturbance. So, also, the person with purely practical aims, is materially supported by the idea of the I or ego. For, unquestionably, every form of thought that has been designedly or undesignedly constructed for a given purpose, possesses for that purpose a permanent value. When, however, physics and psychology meet, the ideas held in the one domain prove to be untenable in the other. From the attempt at mutual adaptation arise the various atomic and monadistic theories – which, however, never attain their end. If we regard sensations, in the sense above defined (p. 13 [i.e. § 7]), as the elements of the world, the problems referred to appear to be disposed of in all essentials, and the first and most important adaptation to be consequently effected. This fundamental view (without any pretension to being a philosophy for all eternity) can at present be adhered to in all fields of experience; it is consequently the one that accommodates itself with the least expenditure of energy, that is, more economically than any other, to the present temporary collective state of knowledge Furthermore, in the consciousness of its purely economical function, this fundamental view is eminently tolerant. It does not obtrude itself into fields in which the current conceptions are still adequate. It is also ever ready, upon subsequent extensions of the field of experience, to give way before a better conception. The presentations and conceptions of the average man of the world are formed and dominated, not by the full and pure desire for knowledge as an end in itself, but by the struggle to adapt himself favourably to the conditions of life. Consequently they are less exact, but at the same time also they are preserved from the monstrosities which easily result from a one-sided and impassioned pursuit of a scientific or philosophical point of view. The unprejudiced man of normal psychological development takes the elements which we have called ABC… to be spatially contiguous and external to the elements KLM…, and he holds this view immediately, and not by any process of psychological projection or logical inference or construction; even were such a process to exist, he would certainly not be conscious of it. He sees, then, an “external world” ABC… different from his body KLM… and existing outside it. As he does not observe at first the dependence of the ABC’s… on the KLM’s… (which are always repeating themselves in the same way and consequently receive little attention), but is always dwelling upon the fixed connexion of the ABC’s… with one another, there appears to him a world of things independent of his Ego. This Ego is formed by the observation of the special properties of the particular thing KLM… with which pain, pleasure, feeling, will, etc., are intimately connected. Further, he notices things K’L’M’…, K”L”M”…, which behave in a manner perfectly analogous to KLM, and whose behaviour he thoroughly understands as soon as he has thought of analogous feelings, sensations, etc., as attached to them in the same way as he observed these feelings, sensations, etc., to be attached to himself. The analogy impelling him to this result is the same as determines him, when he has observed that a wire possesses all the properties of a conductor charged with an electric current, except one which has not yet been directly demonstrated, to conclude that the wire possesses this one property as well. Thus, since he does not perceive the sensations of his fellowmen or of animals but only supplies them by analogy, while he infers from the behaviour of his fellow-men that they are in the same position over against himself, he is led to ascribe to the sensations, memories, etc., a particular ABC… KLM… of a different nature, always differently conceived according to the degree of civilisation he has reached; but this process, as was shown above, is unnecessary, and in science leads into a maze of error, although the falsification is of small significance for practical life. These factors, determining as they do the intellectual outlook of the plain man, make their appearance alternately in him according to the requirements of practical life for the time being, and persist in a state of nearly stable equilibrium. The scientific conception of the world, however, puts the emphasis now upon one, now upon the other factor, makes sometimes one and sometimes the other its starting-point, and, in its struggle for greater precision, unity and consistency, tries, so far as seems possible, to thrust into the background all but the most indispensable conceptions. In this way dualistic and monistic systems arise. The plain man is familiar with blindness and deafness, and knows from his everyday experience that the look of things is influenced by his senses; but it never occurs to him to regard the whole world as the creation of his senses. He would find an idealistic system, or such a monstrosity as solipsism, intolerable in practice. It may easily become a disturbing element in unprejudiced scientific theorising when a conception which is adapted to a particular and strictly limited purpose is promoted in advance to be the foundation of all investigation. This happens, for example, when all experiences are regarded as “effects” of an external world extending into consciousness. This conception gives us a tangle of metaphysical difficulties which it seems impossible to unravel. But the spectre vanishes at once when we look at the matter as it were in a mathematical light, and make it clear to ourselves that all that is valuable to us is the discovery of functional relations, and that what we want to know is merely the dependence of experiences or one another. It then becomes obvious that the reference to unknown fundamental variables which are not given (things-in-themselves) is purely fictitious and superfluous. But even when we allow this fiction, uneconomical though it be, to stand at first, we can still easily distinguish different classes of the mutual dependence of the elements of “the facts of consciousness”; and this alone is important for us. The system of the elements is indicated in the above scheme. Within the space surrounded by a single line lie the elements which belong to the sensible world, – the elements whose regular connexion and peculiar dependence on one another represent both physical (lifeless) bodies and the bodies of men, animals and plants. All these elements, again, stand in a relation of quite peculiar dependence to certain of the elements KLM – the nerves of our body, namely – by which the facts of sense-physiology are expressed. The space surrounded by a double line contains the elements belonging to the higher psychic life, memory-images and presentations, including those which we form of the psychic life of our fellow-men. These may be distinguished by accents. These presentations, again, are connected with one another in a different way (association, fancy) from the sensational elements ABC … KLM, but it cannot be doubted that they are very closely allied to the latter, and that in the last resort their behaviour is determined by ABC … KLM (the totality of the physical world), and especially by our body and nervous system. The presentations α’β’γ’… of the contents of the consciousness of our fellow-men play for us the part of intermediate substitutions, by means of which the behaviour of our fellow-men, – the functional relation of K’L’M’ to ABC – becomes intelligible, in so far as in and for itself (physically) it would remain unexplained. It is therefore important for us to recognise that in all questions in this connexion, which can be intelligibly asked and which can interest us, everything turns on taking into consideration different ultimate variables and different relations of dependence. That is the main point. Nothing will be changed in the actual facts or in the functional relations, whether we regard all the data as contents of consciousness, or as partially so, or as completely physical. The philosophical point of view of the average man – if that term may be applied to his naïve realism – has a claim to the highest consideration. It has arisen in the process of immeasurable time without the intentional assistance of man. It is a product of nature, and is preserved by nature. Everything that philosophy has accomplished – though we may admit the biological justification of every advance, nay, of every error – is, as compared with it, but an insignificant and ephemeral product of art. The fact is, every thinker, every philosopher, the moment he is forced to abandon his one-sided intellectual occupation by practical necessity, immediately returns to the general point of view of mankind. Professor X., who theoretically believes himself to be a solipsist, is certainly not one in practice when he has to thank a Minister of State for a decoration conferred upon him, or when he lectures to an audience. The Pyrrhonist who is cudgelled in Molière’s Le Mariage Forcé, does not go on saying “Il me semble que vous me battez,” but takes his beating as really received. Nor is it the purpose of these “introductory remarks” to discredit the standpoint of the plain man. The task which we have set ourselves is simply to show why and for what purpose we hold that standpoint during most of our lives, and why and for what purpose we are provisionally obliged to abandon it. No point of view has absolute, permanent validity. Each has importance only for some given end. Cf. Petzold’s excellent paper “Solipsismus auf praktischem Gebiet” (Vierteljahresschrift für wissenschaftliche Philosophie, XXV., 3, p. 339); Schuppe, “Der Solipsismus” (Zeitschrift für immanente Philosophie, Vol. III. p. 327).